Posted on 22nd May 2018 at 11:04 am. It’s important to pick your courier company wisely. Do some research and don’t always opt for the cheapest one. A reputable company may charge a slight premium for a fabulous service. But trust us – you’d rather pay a little extra with the knowledge that your delivery items are handled professionally, and with care from A to B, rather than relying on couriers who cut corners. The delivery driver failed to knock on the door for your signature – instead, they posted the item through the letterbox as it was “small enough to fit”! 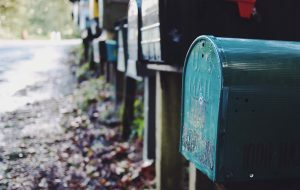 This isn’t great practice on the part of the courier driver – if a signature is required, then it is crucial to get one, even if it fits through a letter box. This is to prove that the delivery was carried out. There’s a name and signature on the tracking website but you don’t recognise it! Doesn’t this just make you want to scream?! A reputable courier company wouldn’t dream of doing such a thing! They will go out of their way to keep packages secure and out of sight from the public. A good courier company will pay attention to your package labelling, such as, “FRAGILE” or “This way Up”. It’s all well and good until the bin man accidentally takes it to the rubbish tip! Or even worse, you mistake it to be rubbish and throw it away! Let’s try to steer clear from “Leave Near Wheelie Bin” instructions. 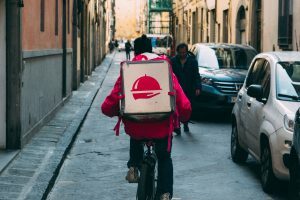 Dogs and delivery people have a long-standing, sometimes bloody history. If you have selected timed delivery, you may want to rethink letting your dog roam the front yard. 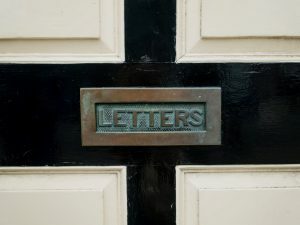 Some couriers, might be frightened of knocking and therefore avoid delivering your item on the specified day. Lucky for us, we have our own pooch on the team, named Roxy. Roxy initially started her career at Mango as a guard dog but then she rapidly worked her way up into becoming a high-profile, London celebrity and social media hit. Check out Roxy’s insta-poses. Left a “you were out card”…when you were in! Okay, so maybe they did knock and you were out in the garden? Or maybe they didn’t knock and just drove off… Maybe they didn’t give you enough time after knocking to respond to the call. Whatever the reason, this is still infuriating for the customer. 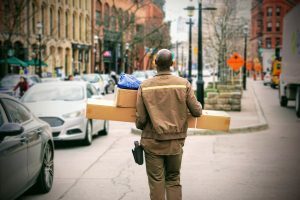 Why have you been charged more for choosing a “Next Day Delivery” when your item arrives a few days or even sometimes WEEKS after the specified “next day”!When you pick a courier company, check their reviews to avoid picking one that’s got a bad reputation for missing next day deliveries. Life can get complicated but we don’t let that get in the way. You can be confident your goods, products and cargo get where they need to be quickly, safely and at the right price with our regulated drivers. Find out about our work ethos, and how we pride ourselves on safe and efficient deliveries.